Our church in Peakirk is uniquely dedicated to St Pega, giving the village its name – Peyakirke – and preserving the memory of this little known 8th Century Anglo-Saxon saint. Pega was the sister of Saint Guthlac, and followed him when he came east from the midlands to seek a remote place where he could live a solitary spiritual life. It’s said that for a time she lived with him on his fen island, now Crowland, but he sent her away and so she settled here in a hermitage in Peakirk, the closest point to on dry land to his own hermitage. When he was dying he sent for her with the message that he had in this life avoided her presence so that in eternity they might ‘see one another in the presence of the Father amid eternal joys’. Pega made the journey by boat to Crowland to conduct his funeral rites and the following year set off on a pilgrimage to Rome, where she died in 719. 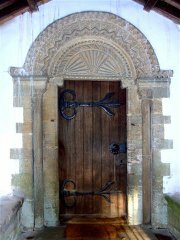 The church is open every day, and visitors are very welcome. The church remains small and has no tall spire to indicate its presence. Tucked away behind the village green, it’s worth seeking out to discover its real glory, the early 14th Century wall paintings. As you enter you’re faced by a large, though faded, painting of St Christopher, to either side of which is a sequence of paintings – a sort of cartoon strip – telling the story of Christ’s Passion . On the north wall are two morality paintings, the Three Living and the Three Dead and the Warning to Gossips. This is the smaller of the two and shows two women enjoying some intense gossip, with the devil perched on their shoulders pressing their heads together. In the larger panel three gorgeously dressed kings hunting in a flower strewn forest encounter three skeletons surrounded by worms and moths, emblems of decay. The story tells how the dead accost the living and say to them ‘As you are, so were we; as we are, so you shall be’. The three living and the three dead is a popular subject for wall paintings, but the warning to gossips is more rarely found. The presence of paintings on the church was recorded by Edmund Artis, the early 19th century local antiquarian and archaeologist, and house steward to Earl Fitzwilliam. 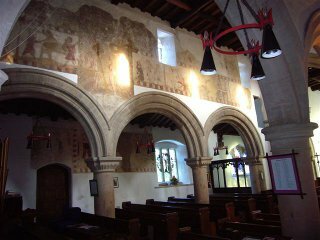 They were fully uncovered and recorded in 1950-51 by the leading expert on wall paintings of the time, Clive Rouse. Unfortunately Rouse covered the paintings in wax, a conservation technique that was already falling from favour. Although much of it was removed in the 1970s, some areas of detail have been lost. We – the congregation and the elected members of our Parochial Church Council – are solely responsible for the maintenance, conservation and repair of this one thousand year old Grade I listed building with its nationally important wall paintings. We are working with a specialist in the conservation of wall paintings to ensure their survival for future generations in as good a condition as possible.